Jennifer I Lim MD, Lucía Manzanas, MD, Manuel Ángel Marcos Fernández, MD, Noah Kim, DO, Sara Sánchez Tabernero, MD, Theodore Leng, MD, MS and Vinay A. Shah M.D. Assigned status Not reviewed by Lucía Manzanas, MD on February 23, 2016. Posterior Vitreous Detachment (PVD) is a separation between the posterior vitreous cortex and the neurosensory retina, with the vitreous collapsing anteriorly towards the vitreous base. 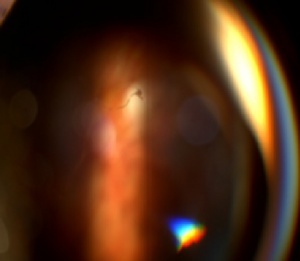 The vitreous is strongly attached to the retina at the vitreous base, a ring shaped area encircling the ora serrata (2mm anterior and 4mm posterior to it). The vitreous is also adherent to the optic disc margin, macula, main retinal vessels and some retinal lesions such as lattice degeneration. The initial event is liquefaction and syneresis of the central vitreous. A rupture develops in the posterior hyaloid (or vitreous cortex) through which liquefied vitreous flows into the retrovitreous space, separating the posterior hyaloid from the retina. It typically starts as a partial PVD in the perifoveal region and is usually asymptomatic until it progresses to the optic disc, when separation of the peripapillary glial tissue from the optic nerve head occurs, usually with formation of a Weiss ring and accompanying symptoms. Vitreous traction at sites of firm adhesion may result in a retinal tear with or without subsequent rhegmatogenous retinal detachment. Incomplete posterior vitreous detachment. Posterior hyaloid is detached from fovea and remains partially attached to optic disc. Prevalence of PVD increases with age and with axial length of the eye. PVD affects most eyes by the eighth decade of life. Age at onset is generally in sixth to seventh decade and men and women appear to be equally affected. PVD occurs earlier in myopic eyes, in eyes with inflammatory disease and following blunt trauma or cataract surgery (especially when there is surgical vitreous loss). Many patients do not present with acute symptoms when PVD occurs. Presenting symptoms include entoptic phenomena such as floaters, change in pattern of floaters and photopsias. Floaters are the most common complaint and result from vitreous opaccities such as blood, glial cells or aggregated collagen fibers torn from the margin of the optic disc. They move with vitreous displacement during eye movement and scatter incident light, which casts a shadow on the retina that is perceived as a grey structure resembling "hairs", "flies" or "spiderwebs". Floaters may continue indefinitely although they usually gradually diminish over time. Photopsias are caused by physical stimulation of the retina from vitreoretinal traction. They reportedly occur in 50% of symptomatic PVD and are usually vertical and temporally located. An alteration in peripheral visual field may indicate a retinal detachment. Indirect ophthalmoscopy with scleral indentation and slit lamp exam with a three-mirror lens are the preferred techniques to confirm PVD and to exclude retinal tears or retinal detachment. The presence of vitreous hemorrhage or pigment may indicate a retinal tear (15% of patients with symptomatic DPV have a retinal tear, as opposed to 50%-70% of patients with DPV+vitreous haemorrhage). If significant hemorrhage interferes with complete examination, bed rest with head at 45º for hours or days with optional bilateral ocular patching may help restore transparency in order to rule out retinal tears. If the source of bleeding cannot be found, the patient should be re-examined regularly and frequently with a vitrectomy considered to identify a source. Echography may be useful in detecting retinal tears with flap or retinal detachment, especially if haemorrhage or other opacification of media limits visualisation. Patients are given strict return precautions and often re-examined within 2-6 weeks after presentation to assess for retinal breaks with a PVD in evolution. Observation with strict retinal detachment precautions, and follow up exam to rule out retinal breaks. Vitrectomy can be considered with non-clearing vitreous hemorrhage. There are no medical therapies recommended for a PVD. After the diagnosis of an acute PVD, a follow up dilated funds examination should be performed approximately 1 month afterwards. It is possible for a new retinal tear or retinal detachment to occur during this dynamic time in the life of the vitreous. There are no surgical indications for routine PVDs. If a partial PVD is present that is causing vitreomacular traction syndrome, pars plana vitrectomy with membrane peeling may be indicated. If surgery is performed, the recommended follow up intervals are day 1, week 1, month 1 and month 3. Serial OCT scans are recommended to assess for anatomic success and correlation with visual acuity outcomes. PVDs are occasionally associated with vitreous hemorrhage, retinal tear and retinal detachment. These should be ruled out during dilated fundus examination of patients with a PVD. The prognosis is generally good for PVD. Boyd K, Vemulakonda GA. Floaters and Flashes. American Academy of Ophthalmology. EyeSmart® Eye health. https://www.aao.org/eye-health/diseases/floaters-flashes-list. Accessed March 13, 2019. Porter D, Vemulakonda GA. Posterior Vitreous Detachment. American Academy of Ophthalmology. EyeSmart® Eye health. https://www.aao.org/eye-health/diseases/posterior-vitreous-detachment-11. Accessed March 22, 2019. American Academy of Ophthalmology. Retina/Vitreous: Posterior vitreous detachment Practicing Ophthalmologists Learning System, 2017 - 2019 San Francisco: American Academy of Ophthalmology, 2017. This page was last modified on March 22, 2019, at 13:48.